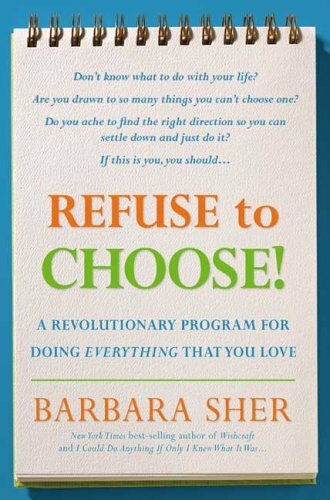 Another book that I have quickly skimmed/read during the read-athon is Refuse to Choose by Barbara Sher. The subtitle for the book is a revolutionary program for doing everything that you love. I was introduced to this author by my sister-in-law who referenced the book on her blog not too long ago. In this book the author refers to “Scanners” as those who are interested in so many different pursuits, that they find it difficult, sometimes impossible, to actually participate in any of them. In the introduction she describes her freshman year of college when all of her friends were trying to decide on a manageable class schedule, and she was mesmerized by all the different courses of study. She simply could not make up her mind, for they all sounded so interesting: The History of Western Music, Ancient Trade Routes of Central Asia, The Geology of History. While none of these particular courses are of interest to me, I have always quipped that my ideal job would be a professional student — if only it paid well rather than cost a fortune. I have learned to be content being a life-long learner instead, using the internet as my personal classroom to pursue whatever interests me at the moment. I found much of the information in this book to be common sense – but when you are a scanner, common sense is the proverbial forest and the only thing we notice are the trees. For example, I know that everyone in life has the same 24 hours a day. I know that no matter how busy I am, there is always some free time in every day. It is a matter of making conscious decisions to fill that time rather than allowing the routine of life to subconsciously dictate my schedule. Barbara Sher is a strong advocate of the calendar — a nice pretty one to hang on the wall in full view – and to actually schedule time for the activities that you WANT to do, rather than putting off that time to “some day” that never seems to arrive. While my interests are varied, I do think that they are manageable. I am fortunate enough to have a job that I actually enjoy — not all parts of it mind you — but overall, I derive immense pleasure and satisfaction from teaching. Along those academic lines, I also enjoy reading and writing (and blogging). My creative interests lie in paper crafts, most notably scrapbooking and rubber stamping. Just recently I have developed an interest in learning more about photography than just point-and-shoot. I would like to take the time to watch more movies – I feel left out of so many family and student conversations. I have always had a deep desire to travel and see other parts of the world, but finances as well as time hinder that pursuit. While these interests are indeed varied, there does not seem to be so many that one would be overwhelmed at the choices. ….Time Sickness, a state of mind frequently found in Scanners in which your whole sense of time in compacted into the present moment and you actually forget that tomorrow exists. That translates into the belief that if you put off doing anything you love, it will be lost forever. And when you love more things than you can possibly do now, Time Sickness creates panic. Now, logically I know that tomorrow exists. Common Sense tells me that I have several more years to devote to personal pursuits. Yet tunnel vision creates that inner voice that is always telling me that I have wasted too much time – that if I were younger I could (fill in the blank) – that life has passed me by. I must say, there is comfort in knowing that I am not the only one who feels this way. There are apparently many others out there who have such dreams, aspirations, and creative desires but are defeating themselves with inaccurate self-talk. I have learned that I am a “dual scanner” which means that I am an either/or type of person – there is no middle ground for me. This false way of thinking is detrimental to living the creative life that I desire. I think this is a part of the reason why I am motivated to try NaNoWriMo this year. There is no time like the present – as they always say — and while I can list a hundred reasons why now is not a good time, the truth of the matter is that there will never be an ideal time. This is my focus for now – and I hope that after November I will be motivated to purchase a new calendar for 2011 — write down specific appointments with myself to pursue other dreams and aspirations – and allow myself the freedom to be me. Better yet, I may do as the author suggests and purchase a 2 year calendar, so that I will always be reminded that there is indeed lots of tomorrows in my future. I think I go in cycles where times I feel that panic that time has been wasted, and then other times where I feel I have all the time in the world. What an interesting book. I love the idea of a calendar–and actually I have one up on the wall every year to remind me of the whole family's appointments and activities–but alas—I never put scheduled activities for me on it! Hope you are enjoying your "in Honor of" day and feel your slump easy up a bit. This sounds like a book that everyone could benefit from .. and I'm a huge believer in taking the time for the stuff that really feeds your soul.